Natasha is studying with Kaori Sato at Conservatory of Music/Purchase College majoring in voice & opera studies. Prior to this, Natasha performed at The Grand Ole Opry in Nashville, Tennessee with the 2014 All-National Honor Mixed Choir under the direction of Ms. Edith Copley. She was also a member of the 2014-2015 NJ All-State Mixed Chorus. Natasha enjoyed the position as first violinist with the Northern New Jersey Youth Orchestra . In November of 2013 she and three other string players from Morris County N.J. were selected as "students of the month" and presented with awards at an Itzhak Perlmann concert. Jazz has been the music Natasha grew up on. The walls at home reverberate with vocalists such as Billie Holiday and instrumentalists such as Miles Davis. Yet, as her voice teacher points out, "she has her own sound-she doesn't copy". $15 advance tickets ($20 at door). $20.00 food/beverage minimum for all attendees. ​$10.00 food and drink minimum for all attendees. 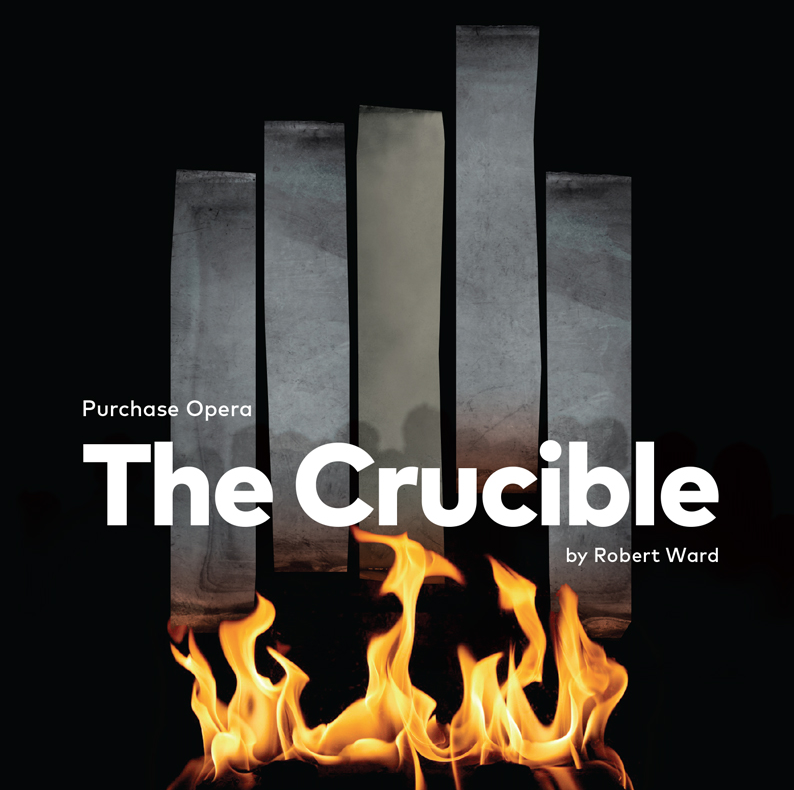 Featuring the Purchase Symphony Orchestra Purchase Opera, ten-time winner of the National Opera Association’s “Best Opera” Award, presents the Pulitzer prize-winning opera by Robert Ward, The Crucible. Based on the classic play by Arthur Miller, the opera tells the chilling tale of the Salem witch trials. A Night of Soul Jazz with Leonieke Scheuble (piano/organ), Bill Crow (bass), Nick Scheuble (drums) and Bill Easley (tenor sax). Hyatt Regency Hotel 2 Albany Street, New Brunswick, New Jersey. Please visit NBJP.org for more information. Purchase College Conservatory of Music Fri Oct. 23 2015 (7pm) & Sat Oct 24 (1pm). Hansel and Gretel will feature students in the Purchase College Conservatory of Music’s Voice and Opera Studies department—a highly selective conservatory program that has won 10 top awards for its professional-level productions from the National Opera Association.Based on the popular fairytale by the Brothers Grimm, this energetic opera, composed by Engelbert Humperdinck, is fully staged with elaborate sets and costumes. The opera is performed in German with English subtitles that are easy to follow for young audience members. The performance is just under two hours including a 20-minute intermission. Adult tickets are $20 and $10 for children. Discounts are available for Purchase College students and seniors. To order tickets, please visit www.artscenter.org or call 914.251.6200. 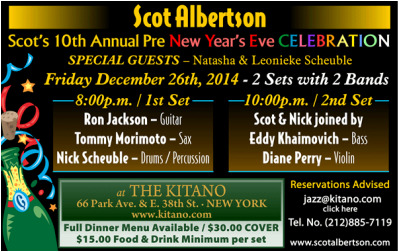 ﻿KITANO﻿ Scot's 10th Annual Pre New Years's Celebration Fri, 12/26/14 . Natasha and Leonieke Scheuble are special guests of Scot Albertson. Scot Albertson returns to the Symphony Space Leonard Nimoy Thalia Theatre for his annual concert on Thursday September 4, 2014 7:30p.m. This night includes two sets with two bands featuring Bassist / Composer Mark Egan. Special guests Natasha Scheuble and Leonieke Scheuble make a cameo performance during the first set. Tickets $19.00 advanced. $25.00 day of show. $15.00 members, students and seniors. Tel. # (212) 594-6100 – www.Dimennacenter.org. Copyright © 2017, by Natasha Scheuble. All rights reserved.